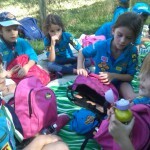 First meeting after the summer break at Parque Europa (Torrejon de Ardoz). 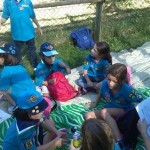 The troop has increased with new kids that joined the Beavers group. Some of the Cubs have moved up to Scouts making a total of 17. All of them were ready for a multi-adventure tour in the park. They began jumping on the trampolines. Now, it was time to row for a while on the “lake”. The beavers learnt how to go forward, backward and steer to the left (port) and to the right (starboard) . After a hard work rowing the boat, a Little snack to recover the energy. And finally, they played some different games. 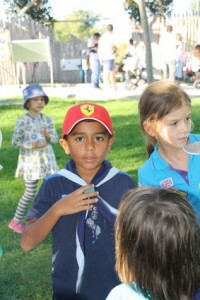 Sander, one of the new Beavers, taught us a new game he played at the Scouts in London. All of them had a lot of fun with the new game, and then, they decided Sander deserved to be the “Beaver of the Month”. 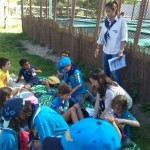 20 brave Cubs and Scouts braved a walk through the treetops at Parque Europa. Our thanls to the team at Parque Europa who kitted us out and, literally, showed us the ropes. On a day which saw several newcomers to the organization, with a backdrop of glorious September sun, our Cubs and Scouts climbed, scampered, edged and teetered their way around the high rope walls before zipping 200 metres back down to earth. They also enjoyed jumping on the trampolines for a while.